Originally written by Corey Kelly for Askmen.com and published on August 5th 2016. Click here to read the original post. Camouflage is a ubiquitous motif that never seems to go out of style. Looking less Duck Dynasty and more Dior Homme is your ultimate goal when incorporating it into your everyday attire. It’s important to take notes from the runways of fashion designers, from Dries Van Noten to Riccardo Tisci (for Givenchy), who’ve sprinkled pops of camo – not to mention military accents and olive hues — into their latest menswear collections. But, before you G.I. Jones your way out the door in camo prints, remember that less-is-more when styling your next look. 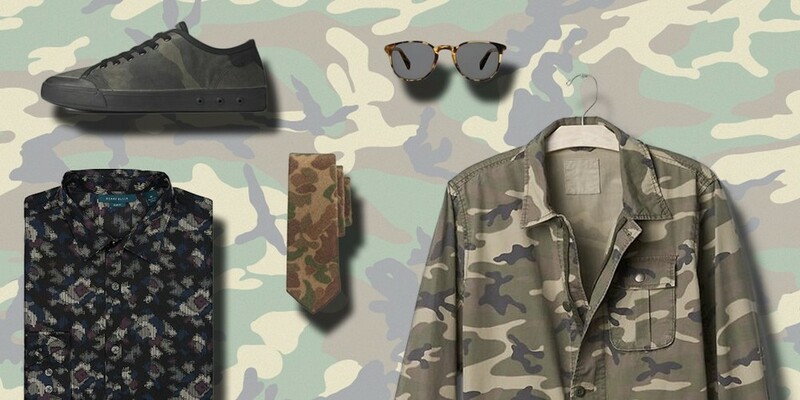 Build with one statement item – a camo coat, pant, shirt, you name it – to create a cohesive, pulled-together ensemble. Instead of stealing the spotlight, accent pieces like camo-printed apparel and accessories should cohesively blend with other colors and prints. That’s why we’ve scoured the market to find you those very items which perfectly highlight this reoccurring trend. From Rag & Bone’s sickening lace up sneakers to a vintage-inspired sweatshirt (courtesy of Todd Snyder’s latest collab), we highlight nine wearable pieces that’ll camouflage your wardrobe into high-style right now.